We are back! I’m sure you all heard about the abrupt halt to our paddling adventure due to the truck being totaled. We got all the insurance issues cleared up and even got a new truck. We are paddling unsupported. No road crew or truck and camper, just Joe and I with our Kayaks. We are loaded with all our camping gear and enough food for 35 days. We will have more food delivered as needed. We got back in our boats at Kewaunee, the very same place we left off. We were greeted by rain, sat on shore till it stopped and then continued on to Algoma, 11 1/2 miles. We camped at Sunrise Cove and Marina, it is the coolest place on the lake. The owners are amazing and gave us our spot for free when they heard what our cause is. (Pediatric brain cancer research) They also have a bar there called Smashed On The Rocks, the burgers and beer were great! Make sure to stop and check it out if you are ever in the area….you will miss something special if you don’t! Tell them 2paddling5 sent you. We met some great folks while we were eating, had a really nice visit and were given some fresh frozen fish, polish sausage and ring bologna. Talk about eating good, it was all amazing and such a treat! 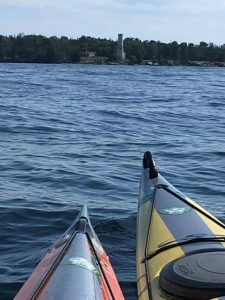 We left bright and early the next morning and had a great day adding 36 miles and landing 2 1/2 miles from Baileys Harbor. Found a nice spot to camp and had an awesome thunder storm that put me to sleep just like a lullaby. July 7 we had wet tent and bags when we got up but that’s just part of the experience. We had a few crossings that went well and stopped for lunch in a beautiful cove with big old trees and huge rocks the were landscaped in by Mother Nature. Water all around a little point, I could live there. Left to finish our day but when we got back to the big water we turned around and went back. We decided to dry our soggy mess and then head out. The wind didn’t let up and we decided to call it for the day. Only 11 1/2 miles but it was a great day. 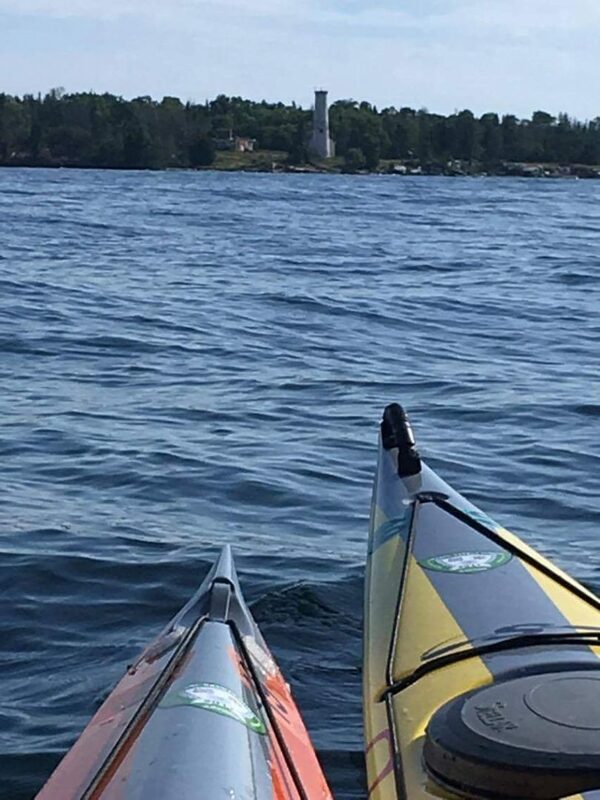 July 8 we paddled through Dearh’s Door, something I have heard stories about and have had bad dreams about, spent lots of time thinking about it. It was a great paddle, nothing like I was expecting, thank goodness. We stopped at Washington Island and visited with some of Joe’s friends. Were treated to lunch at Bread and Water and the food was perfect. Visited Valerie Fons at her farm and hung a boat in the rafters of her barn for a future project of hers. It was a nice day. We left after taking showers, such a luxury and so appreciated. Got back in our boats at 6 and headed to Rock Island, not a calm paddle by any means but we made it without any problems. 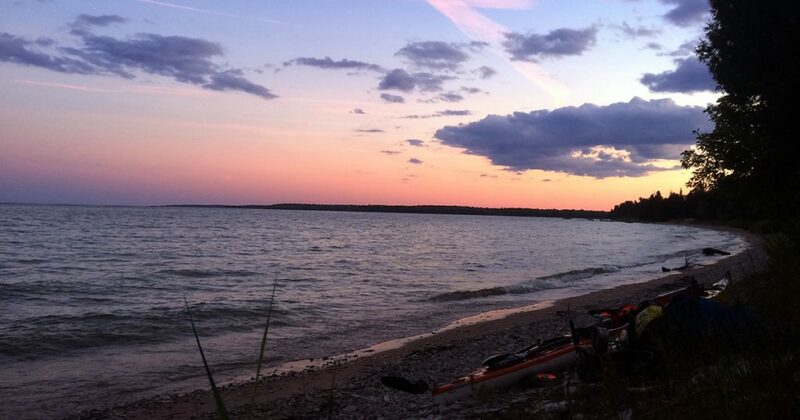 26 miles paddled and a gorgeous camp site with the best view of the night sky. July 9th we set out to hop from island to island, we are back in Michigan. The first hop was a challenge and I was not happy about the waves but it went well. We planned to rest after that but saw a snake in the water and Joe decided he was not about to stop there so we continued on. The water was perfectly calm all the rest of the day and we had a blast. Another day that was big and scary in my mind but turned out enjoyable for both of us. We made 23 miles and had to stop for a storm coming in. We set up ate and got in the tent just before the rain hit. Tons of rain, no cell service and a nice nap. It’s good to be back on track. A great piece you’ve got here. I remember my last outdoor kayaking experience on the Waccamaw River in Conway. It was a great experience though it was my first time riding on a kayak and I was a little paranoid. I will have to explore more with kayaking and where possible enjoy fishing on the shallow shores.